Dance Guilde - Historic Interpretations, Inc. Historic Interpretations' Dance Guilde is a key component of our reenactment performances in both Renaissance and Colonial Eras. Dance has historically been the main means of social interaction and this unique group not only teaches you the steps of the past, but the etymologies of today's dance. All are welcome to join, regardless of skill or ability. 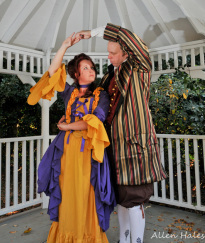 Two dance types, the French minuet and the English country dance, became the staple of eighteenth-century ballrooms in much of the western world. Ideally suited for performance by dancers of varying skills and abilities, each offered a distinct structure that was fairly easy to learn. Masters could create new dances every year; composers wrote new tunes. Printers had increasingly cheaper methods by which to reproduce these effusions and the public bought them eagerly. Elizabethan dances differed between the Upper and Lower Classes. The Upper Classes enjoyed new types of music at court. They had a taste for new music and new dances. Many courtiers travelled abroad and returned to the Elizabethan court with dances from Italy, Spain and France. These foreign influences were found in the development of new Elizabethan court dances and music. These new dances had to be learnt and Dancing Masters were suitably employed. These Elizabethan dances were highly sophisticated and stately with intricate steps and nuances, although the old favorite English country dances were still popular. Many of the Court dances were performed as couples and the suggestive Elizabethan court dance called the Volt was the only dance which allowed the dancers to embrace closely. The form of entertainment called the Masque was popular with the Upper classes. Masques were accompanied with music and dance at the beginning and end of the performances and during the interludes.